Bathe was established in early 2010 by proprietor and manager, Colm Mullan who himself enjoys over 10 years experience in the field of bathroom supplies and fittings. 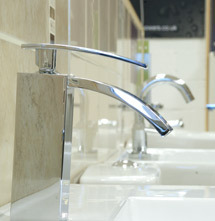 We offers free delivery as standard all purchases, as well as out of hours, complimentary consultation for clients who are unable to make it to the showroom within office hours..
As a family run business, Bathe understand and response to its customer's needs, and we are here to ensure that your next bathroom is your dream bathroom! Don't hesitate to drop us an e-mail today or call us; we will be more than happy to help.